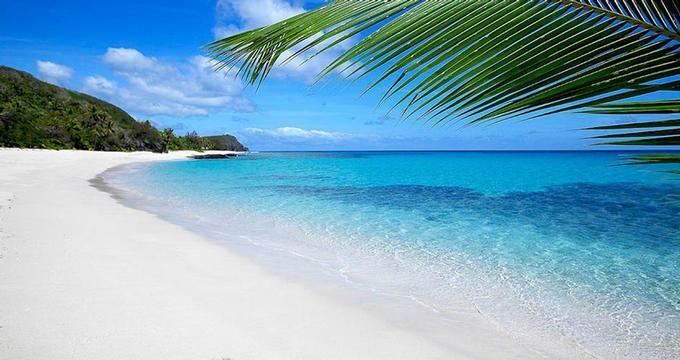 Yasawa, which in Fijian means heaven, is a tropical island hideaway in Fiji with 11 white-sand beaches, numerous dive sites and native villages. The resort offers just 16 luxury bures and is one the most secluded private island resorts in the South Pacific. The island is a paradise for couples who love secluded beaches, plenty of sunshine and five star service. You can take endless walks down the soft sand, watch the starry night sky and have secluded picnics either in the sand or a completely secluded spot somewhere up on a hill with a view. The resort staff is ready to recommend romantic activities and cater to all your wishes. Guests spend their days exploring the beaches, getting a massage, game fishing, kayaking and scuba diving. Food is prepared using fresh local seafood, vegetables and tropical fruit. Dishes are light and artfully presented in a casual ambiance. If you wish to get married on a beach, the staff can arrange a romantic wedding, which will include beautiful floral decorations and a Fijian choir (wedding packages start at US $1,850). Baravi Spa draws its inspiration from the pristine ocean that surrounds the island. Have a massage on the ocean-view massage deck over the beach, enjoying soothing ocean breezes. You can also request treatments in the privacy of your suite or villa on your honeymoon. Resort accommodations are spacious with a separate lounge and ample deck space where guests can take an outdoor shower and relax in a hammock. The Lomalagi Bure was especially designed for honeymooners who can enjoy an outdoor dining area and a rock water feature on their island hideaway. There are 18 guest houses to choose from with thatched roofs, air-conditioning, outdoor shower, deck with daybeds for napping, a separate living area with mini bar and iPod docking station and a hammock under the palm trees. You will also receive a private thatched cabana with sun loungers right on the white sandy beach. Bure (boor-ray) means Sanctuary in Fijian. Bure Suites: There are Bure Suites decorated in modern style and an open-plan layout. These suites share one adjoining wall and are close enough to the ocean that you can hear if from your bed if you leave the windows open. Deluxe Bures: The 10 Deluxe Bures are free standing, offering more privacy. You will see the ocean from every spot in this beautiful abode. The split-level design creates separate living and sleeping areas. Honeymoon Villa: The Honeymoon Bure is called Lomalagi (LO-ma-lang-ee) which means Heaven in Fijian. It is hidden from the rest of the resort and set on its own private stretch of beach. Take a dip in the private infinity edge pool just steps from the beach. If you are looking for the best place to stay on your honeymoon or anniversary in the South Pacific, it doesn't get any better than this. Two Bedroom Bure: This tropical house is elevated on a hill. It's a great choice for couples as well as families with older children because ite two-bedroom layout will give you plenty of space. Have breakfast on the outdoor deck with sweeping views of the sea. While the resort welcomes children over 12 year-round, if you are planning a vacation with younger kids, you will have to go during one of the Family Weeks. The Kids' Club ("Kachi Club") is a creative program that teaches kids about culture, environment and the natural world. Fijian staff will guide them through a number of activities, from beach combing, sea exploration and visits to the local village. Kids will receive healthy meals. Upcoming family weeks are as follows: 20 September – 12 October, 2014; 14 December, 2014 – 13 January, 2015; 28 March – 25 April, 2015; 20 June – 19 July, 2015; 19 September – 11 October, 2015; 12 December, 2015 – 10 January 2016; 01 February – 22 February, 2016; 24-31 March, 2016. Fiji is home to some of the most unexplored dive sites in the world. Whether you are a novice or an experienced diver, the resort will make sure you get all the personal attention you need from expert dive masters and crew. You will have the chance to visit secluded dive sites which are not visited by any other boats. Amazing underwater fauna and flora include the green Cabbage Coral and Orange Fans. One tank dives cost US $85; two tank dives $120; PADI scuba diving courses cost US $370. Diving equipment and wet suites are included in the cost of the dive. Underwater cameras can be rented for US $35. Certified dive guests will be required to show a certification card. Fly to Nadi International Airport. From there, you will have to take a 35-minute flight to Yasawa, which has its own air strip. The transfers are operated by the resort so you should book your flight from Nadi to Yasawa directly with the resort (rates start at US $175 per person each way). There is a strict baggage limit of 15 kg per person. The resort frequently offers deals and packages, including free nights and kids stay free during family weeks. The specials to look for are: Stay 3/Pay 2, Stay 5/Pay 4, and Stay 7 – Pay 5. Since they are only available during certain periods, ask about them when booking your stay. Bures cost $1,000 per night for two guests; honeymoon bure is $1,800 per night plus tax. The rate includes all meals, all non-alcoholic beverages and many activities. Le Tahaa on the "Vanilla Island"